Freelance travel writing is regarded as a highly glamorous and romantic occupation. Every travel writer dreams of relaxing at luxury spas or playing at coastal golf resorts, or cruising along European waterways sipping wine or zip-lining through exotic jungles. 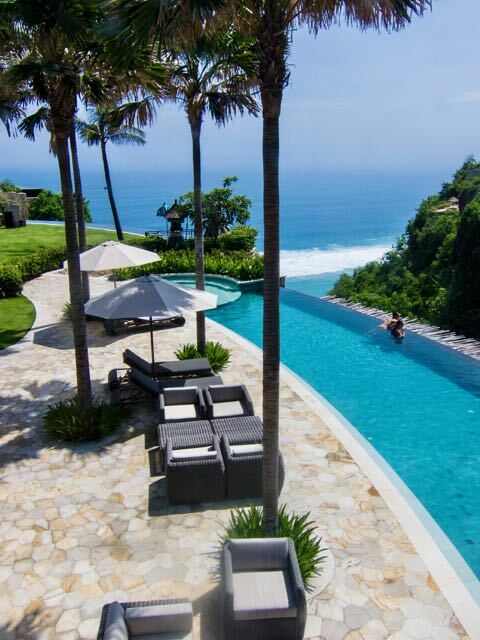 Here's the view of the pool at the Semara Uluwatu Resort in Bali, Indonesia. We had the same view from our private pool when we stayed in one of the villas here. Many travel writers are fortunate enough to live these dreams – and they’ve earned it. So it’s easy to understand why everyone wants to be a travel writer or travel blogger. This highly competitive field attracts thousands of dewy-eyed hopefuls every week. But every week thousands of disillusioned people drop out. After suffering a constant stream of rejection letters from editors, or worse, never hearing back from them – they drift away. Why such a high dropout rate for something that appears to be so easy and so much fun? The reality is, breaking into travel writing and getting your stories published in print is difficult. 1. Solid writing abilities and a knack for identifying unique travel stories. 2. The savvy to create enticing query letters and then find enough viable magazine leads to pitch. 3. Knowing how and when to approach Destination Marketing Organizations (DMOs) for assistance with your itinerary and complimentary travel perks, and when to wrangle entry into attractions on your own. And these just scratch the surface of the talents needed to succeed. The list goes on. However, many aspiring travel writers actually have the right stuff to get their travel stories published. They just need the right kind of help to help them get over the hurdles. Most beginners are already halfway decent writers. And if you’re not a good writer, you can take creative writing courses to improve your writing techniques and your ‘voice’. It’s also possible for new travel writers to also develop their ‘story antenna’ for detecting good story ideas. There are several techniques for doing this that are easy to learn. If you’re a beginner, you can also read up on how to write good query letters or how to politely request complimentary assistance with your travel plans. There are plenty of do-it-yourself guides available to help you, including several that I’ve written. All of the above skills can be learned or developed with some patience, lots of persistence and a few good references. 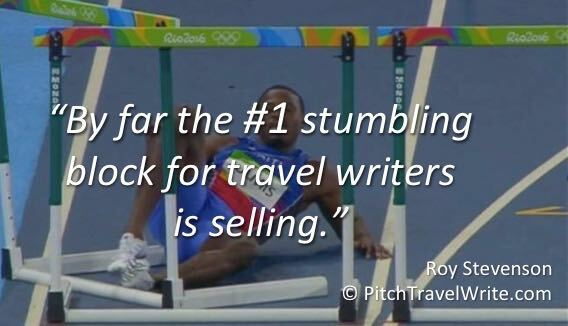 But the #1 stumbling block for aspiring travel writers is selling and marketing. Selling isn't easy to learn in a do-it-yourself environment unless you're a natural marketer. Sadly, most of us aren't natural marketers. Acquiring effective marketing skills to sell your stories is like learning a new language. It's awkward, uncomfortable and in many cases unachievable for most beginners. In travel writing, just as in any other business, you must learn to sell. As a travel writer you must sell your story ideas if you want to get published. You need to convince editors you’re the right person to write the article even when you don’t have any bylines. And you need to sell yourself to DMOs when you’re requesting travel perks. Selling is not a dirty word. It’s a necessity. You can’t succeed without it. I frequently tell people, “If you can’t sell your stories, you don’t get to write them.” And, you miss out on the marvelous travel benefits and perks that come with having assignments. Over the past two years I’ve coached several dozen novice travel writers. Apart from a couple of ‘natural marketers’, the others have all hit the sales and marketing hurdle hard. If you lack sales and marketing skills, you’re definitely not alone. Based on my coaching experience, ninety percent of new writers lack the basic sales and marketing knowledge to get their stories published in print media. This explains the abysmally low sales and publication rate for novice writers. Sure, you can get published online. But most of the time you’re giving those articles away for free, so you’re not earning any money. Getting published in print takes more finesse. Most beginners don't sell any stories at all after spending months sending out query letters to magazines. They’re lucky to have one in thirty of their story ideas published in print magazines, if that. Selling your travel stories is as much an art as it is a science. When you start out, it’s oh so easy to screw up your chances of selling your story by making amateurish mistakes. And marketing doesn’t stop at selling your stories. You also need to develop your travel-writing persona and build your writer’s platform, or brand. I’ve met plenty of writers at conferences and workshops and on press trips that are far better writers than I am — and better than I can ever hope to be. Their writing is faultless. Their articles flow superbly and lead me effortlessly from one paragraph to the next. Their stories draw me in, and inform and entertain. Yet, when we talk about where we’ve been published and how many articles we’ve had published, I outgun my more talented writing peers by a huge order of magnitude. In fact, several of these same travel writers have paid me as a marketing coach to help them get published more prolifically. The major difference is that I know how to market my articles to magazine editors. I’m very good at selling my stories. I seem to be wired for sales and marketing. In nine years as a freelance travel writer I’ve . . .
• Sold 90% of the stories I pitch to print magazines. I’m not telling you this to brag, although I’m proud of my accomplishments. I’m telling you this as a basis of comparison. Most of my travel-writing peers languish on sales rates between 25% and 40%, and less than 50 publications after years of writing. This isn’t because of their writing skills. It’s because they lack sufficient sales and marketing abilities. The good news is: the sales process can be learned. How to market yourself and build your platform can be learned. And like everything else in life, it’s best to learn the ropes from someone who has done the work. 1) A coach can guide you in the creative processes of dreaming up marketable travel story ideas and writing enticing query letters. 2) You can learn how to assemble thorough magazine distribution lists so you have plenty of sales leads to pitch your stories. 3) A marketing mentor can review and give you feedback on query letters and articles before you send them to editors. 4) You can get on-the-spot advice and guidance dealing with magazine editors. Many different tricky situations crop up when you’re selling your articles, and beginners seem to choose the worst options. A seasoned professional can guide you through this minefield. 5) A coach and mentor can tell you how to use your assignment to request travel comps from DMOs and clue you in to other resources available. My specialty as a marketing coach is showing my travel writers how to get their stories published in print media, and then capitalizing on these assignments with complimentary accommodations, meals, transport, tours, guides, and entry to tourist attractions. My clients have had tremendous success! Ninety-five percent of them have had at least one story published, and most of them have had multiple stories published in print media. And the writers who got assignments prior to travel learned to use them to score complimentary travel, accommodations, meals, and entry to tourist attractions. Often the comps were beyond their wildest dreams! If you're struggling to sell your travel stories, and want to learn how to turn your assignments into complimentary travel, you can benefit from my coaching and mentoring services. I'll help you build your writer's platform from scratch. Coaching registration is currently closed. I take new clients twice each year, starting in January and June. 3 different packages are available: 4 months, 6 months and 12 months. Details will be available when registration opens. • Jed hired me to help him get print and online assignments for an upcoming trip to England. He secured six paying assignments with print magazines (including Discover Britain, Renaissance, and Kindred Spirit), plus a couple of online assignments, and landed several complimentary perks such as free accommodations, meals, tours, and entry to tourist attractions. Jed also got some nice comps (free tours, lodging, meals) in Montana with an assignment for Northwest Travel & Lifestyle Magazine under my guidance. • Tracey got three paid assignments with Canoe & Kayak magazine, plus an assignment with Cruise Travel Magazine, and one more assignment with another print magazine for an upcoming trip to the Cayman Islands in the Caribbean. Then, under my guidance, she used her assignments as collateral for complimentary meals and tours and other tourist activities for her trip, saving her some serious $$. • Tim, a U.K. writer, needed some assignments to qualify for a weeklong press trip in a 4 x 4 vehicle convoy across the Central Greek Mountains. He struck out with his query letters and hired me to help him round up assignments for his press trip. Within a few days he had two high-paying assignments with print magazines, and got his press trip, which he enjoyed immensely (his story about this journey was great!). I also helped him get a paid story about a military museum in Athens published into a U.K. military magazine. • Patricia, a U.K. writer, followed my marketing tips and secured a paid travel story in glossy Australia & New Zealand Magazine. You can also read the stories of Barb Harmon and Tim Cotroneo, two travel writers who learned about travel writing simply by reading this website (PitchTravelWrite.com) and buying a few low-cost ebooks.